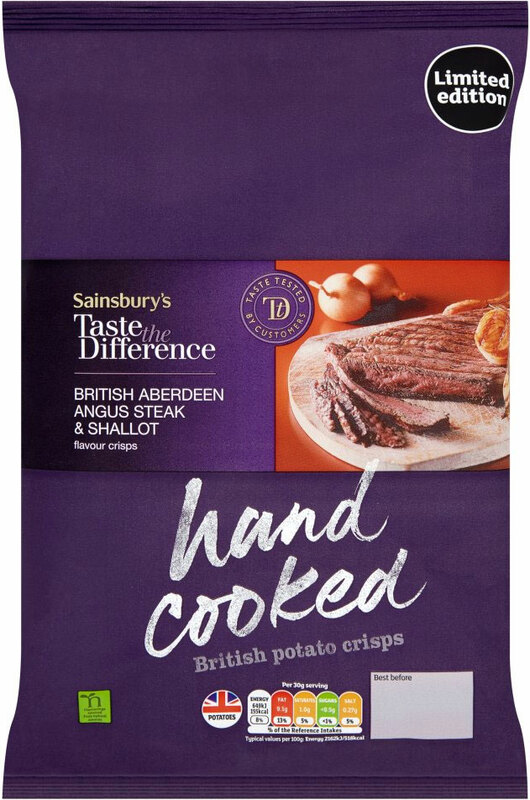 According to Sainsbury's the most important aspect of this design is the 'Hand Cooked' factor. It's all purple, for some reason and there is a rather unappealing image of the flavour content. These Crisps were oil blistered and creamy gold in colour, with a reasonable amount of seasoning visible. There was plenty of skin on the edges and oil infused. We have only ever had one occasion where we at Chips and Crisps felt it necessary to approach a manufacturer to question their Crisp. You can read that elsewhere on this website. Suffice it to say – it was a plain/traditional flavoured Crisp without any seasoning. I mention this here because this was the first occasion that we have ever come across a Crisp with the wrong flavour! We questioned ourselves then second guessed ourselves, but in the end we had no other conclusion than these were Chicken flavoured Crisps. There was absolutely nothing similar to the flavouring written on the packet than a slight hint of Rosemary.